Race Decisions – When Are You Being Too Picky? I’ve been running races on and off since high school. Which, considering that took place in another millennium, that adds up to a lot of racing. ALOT. Some were awesome (all the Disney races), some stunk, (I Care I Cure 5k), and some were someplace in between, (Race for Women’s Wellness Half Marathon). Each one a learning experience in it’s own right. As I start looking at the calendar to pick my races for this year – and I’d like there to be more than the 1 or 2 I did last year, because, ya know……..LIFE – I get this feeling I may have set my requirements for races just a tad high. By all means, please weigh in here. Manned water stations and/or appropriately supplied: I did a 10k on New Year’s Eve 2017 along the beach in Boca Raton. The two minutes you could actually watch the sun rise over the ocean was lovely, but once you turned off into one of the local neighborhoods, the scene wasn’t so pretty. The one water station around Mile 4ish had one poor guy and his young son ferverishly trying to get water poured and out to the few hundred saps slogging by. A couple of miles through the neighborhood brought us back to the same water station, only to find it both unmanned and out of water. I was pretty much running in the middle of the pack, so I can only imagine how much worse it got for the runners behind me in the typical south Florida humidity that never seems to go away. Now I know how difficult it can be to find enough volunteers for events like this. However, this race has been taking place every year for the past 39 years. Yes, 39 YEARS. You think just maybe they might have stuff like this figured out by now, especially in the tropics? Kids get their own race: Make no mistake, I am ALL about kids putting down their phones and getting outside to move. But if you’re doing everything you can to keep from running them over because they’re fully engaged in the “let’s sprint for 50 yards then come to a dead stop in front of some poor, unsuspecting sap whose brakes don’t work as well” mode, then the kiddies need to have their own kid moment of glory, if for no other reason than this poor unsuspecting sap’s knees can’t take emergency braking every 50 yards. If you’re doing swag, do it right: One word. DriFit. I’ll pay an extra few bucks on the reg fees. Use your outside voice: Let it rip at the start people. Especially for those saps like me who prefer to start at the back of the pack and haven’t had any mochaccinos before the start. We can’t hear you chatting it up with the serious speed queens in the front row when you suddenly drop a “oh, let’s get this race started shall we?” And pack up those obnoxious bullhorns. They don’t work either. Good option – put that local cheerleading squad to work. Megaphones aren’t just for football anymore. Take that constructive criticism seriously: I can only imagine some of the ridiculous requests race directors see when they get their post-race surveys back. However, there may be one or two that are actually good ideas that don’t cost anything extra to incorporate into the race day planning. Like perhaps noting on the race website that drivers in the area ARE CRAZY AND DON’T PAY ATTENTION TO WHERE THEY’RE GOING SO FOR GAWD’S SAKE, KEEP YOUR HEAD ON A SWIVEL. No lady, I’m not sorry for scaring the crap out of you when I slammed a paw on the hood of your car as you looked right at me and hit the gas anyway. All of the above noted requests, along with a few others (location, cost, registration fees, charity, etc) help me determine which races will hit my calendar in any given year. My question for you is this. Am I being too picky in what I want/need/expect from a race? In my immediate area, 5k’s are rampant, 10k’s practically non-existent, half marathons are not too bad, and full marathons seem to be everywhere. As I have yet to PR my half, I always have a few to choose from to maybe someday actually get it done. My hesitation mainly stems from most of them, while geographically desirable, are not always the most convenient to actually get to, requiring one of those classic Disney 3am wake up alarms in order to have enough time to get ready, travel, park, get to the start, and warm up. Plus, I know for logistical reasons, many in this area are held on Sundays. Having a Monday-Friday desk job, a Sunday half doesn’t always equate to feeling so well the next day when you’re stuck in a chair and can’t really keep loose to fight off the DOMS. As 2019 brings me to yet another year of debating which races will hit my schedule, I can only say this. Every year I am eternally grateful that I have the ability and the resources to keep up with this crazy little hobby of mine. Like anyone, I like to get the most bang for my buck and that is true for each race I consider. Sometimes I wonder though. Maybe I’d be better off just closing my eyes and pointing a finger? Seems to always work well in my wine cooler. What helps you determine what races you will participate in? What are your race pet peeves? Have you ever responded to a race survey? 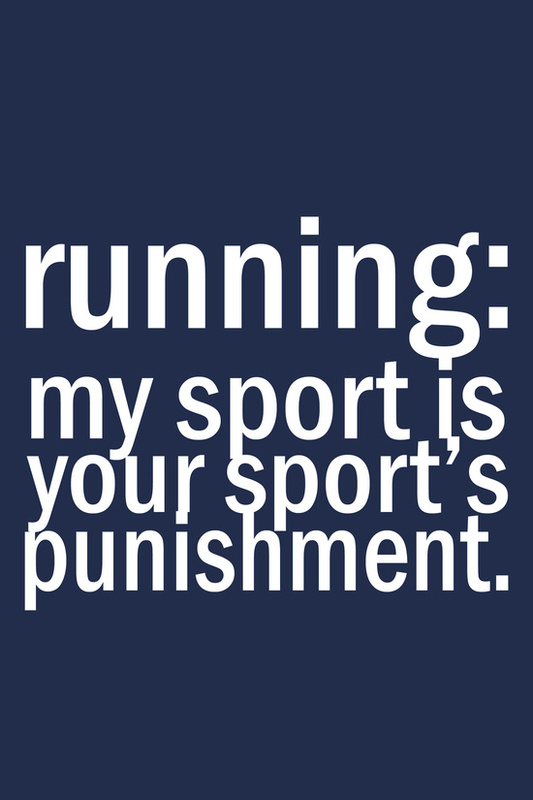 In honor of those running the Everglades Half Marathon this weekend, we send you our best wishes. Along with our typical “off” sense of humor….. Does your dog/spouse and/or kid ever give you this look? Do you feel proud if they do? Since all of our family and friends made it through last weekend’s weather shenanigans in one piece, we thought it was time to honor what seems to be a new annual late fall tradition. 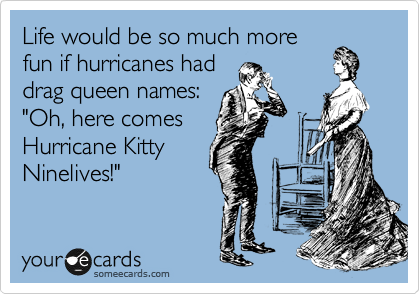 Have you ever had to “weather” a hurricane? Are you more of a be prepared type with batteries and non-perishable food items, or do you tend to stock up on booze and peanut M&M’s? I’m sure you could never figure out which type Black Dog Productions is! Do you live in area that’s always under threat of storms? Do you tend to panic or party? Have you ever thrown a hurricane party? As I sit here crashed on my couch at Island Time Tiki Bar, Calypso taking up most of all the available cushion space, it’s challenging to figure out where to start my recap of the Wings for Life World Run. It wasn’t a typical “race” in any normal race terms. Oh contraire, not in the least. There was the usual mix of participants – serious runners (not me), weekend warriors (also not me), people just out to see what they could do (getting warmer), and just plain shenanigators (BINGO!). Then there were the athletes being pushed in their wheelchairs, athletes pushing themselves in wheelchairs, and even an athlete making his way along with his cane. The energy and anticipation at the start was palpable, due in no small part to the big screen broadcasting video of hundreds of thousands runners at their own start lines, 34 in all. It was….well……pretty damn amazing awesomeness. This was the first race in a really, really long time that I had planned on going balls to the wall as much as I could. The hubs was also running with me for the first time in a couple of years, and as he was nursing a hammy injury and a lingering case of the plague, we had to take that into account for our race strategy. Excuse me, but did you say race strategy? Who are you and what have you done with our Black Dog? I am happy to report this plan worked out pretty damn well for us! After what seemed like an interminable length of time just trying to get out of the BB&T Center parking lot, (seriously, how big IS this damn lot?! ), we finally made it out onto the scenic streets of Sunrise, FLA. With NO sunglasses. Lesson #1: just because it looks like you won’t be running directly east, don’t ever trust your sense of direction that early in the morning. Ever. Returning to the scene of the crime, we continued on our merry jaunt – happily knee pain free – for what seemed like an interminable length of time until we finally arrived at the first water stop. Now, let me tell ya, these people know what they’re doing. Mile 2, complete with Clif bars, Red Bull, H2O, Gatorade and portapotties. With a line. The dreaded portapotty line. Duhn, duhn, duuuuuhhhhnnnnnn…..
After making a valiant effort at patience – 30 seconds give or take – it was time to create a little suburban drama. After quickly surveying the scene and knowing the chase car would be hot on our collective tails any moment, the command decision was made to…..well….blaze a new trail. Right to the nearest bunch of bushes. Completely runDisney style. Hey, ya gotta go, ya gotta go. No elephants were violated in the taking of this picture. As I not so discreetly did what I had to do and high-tailed it back to the road, what do I see but the guy who had been standing in line in front of me headed for the same bushes. With a big thank you and a thumbs up we passed like ships in the night and the hubs and I were back on our way. No idea how the bush is currently doing…. I’d give you more specifics about the course, but since this area of Broward County is like another country to me, I can’t tell you where we were at just about any given moment. What I can tell you is this: the volunteers at the water stops were amazing. The cheering groups with their witty race signs were amazing. The cops and PSA’s of the Sunrise Police Department were the best. Not so awesomesauce? That damn helicopter. When that bad boy was flying overhead, you knew the chase car was stalking in the near vicinity. Soon after stopping at the third water stop – complete with music blasting and a cheer squad – the hubby turns around and starts yelling at everyone to run for their lives. At this point it seemed everyone around us had entered spaced-out zombie zone and had forgotten the little fact that we were being CHASED. That is, until they saw the chase car slowly gaining ground. What quickly ensued would have made Usain Bolt jealous. And just like that, our race was done. Actually, after walking another almost two miles to the next water stop it was done. By then, the partymobiles shuttle buses had shown up to take everyone back to Party Central at the start. But not before we took full advantage of the fact that our bus was one normally used for the students on the campus at the University of Miami. And if you follow college sports at all, then you know there is no love lost between Miami Hurricane fans and that other school up in Gainesville. Needless to say, we took full advantage of the situation this poor guy found himself in the middle of. Poor guy. Knew he was outnumbered from the start. Didn’t even bother putting up a fight. Oh Robert. Poor, poor Robert. We didn’t stick around too long as it was getting quite toasty and the call of a nice long shower was singing its siren song. Off to the homestead we went, but we were able to follow the rest of the race on the live-stream via the Wings for Life website. Five and a half hours after the worldwide start, Giorgio Calcaterra was finally caught by the chase car outside Milan, Italy. He ran an AMAZING 88.44 km (or 54.95 miles for those of metrically challenged). The last female runner to be caught was Kaori Yoshida from Japan who was caught at the 65.71 km/40.83 mile mark, outside Takashima, Japan. Sunrise was lucky enough to have the 10th female overall with Nathalie Vasseur from France. She managed to hold off melting in the heat long enough to hold off the chase car until she hit 54.53km/33.88 miles. Damn alligators never stood a chance against Miss Speedy Pants. Looking back at the event now, it’s easy to see why so many people have returned each year. In the three years since it’s inception, the Wings for Life World Run has seen an increase in participation each year. The best part of all? This year set a new record in the amount of money raised for spinal cord injury research – a whopping $7.4 million (yes MILLION!) And when you see someone who has never taken a step, walk for the very first time due in part to the funds raised from this event, well, let’s just say it makes all the sweat, aches, pains, #brokeknees, and miles all worth it. Have you ever done a race with no actual finish line? Raised money for charity? Did it make the race feel more special?